Gov. Rick Perry of Texas will end his bid for the Republican presidential nomination on Thursday and endorse Newt Gingrich, two campaign officials confirmed, a decision that could influence the South Carolina primary on Saturday. ….Mr. Perry will not participate in the debate here on Thursday evening, an aide said, and will make the announcement to supporters and contributors in South Carolina at an 11 a.m.
news conference. He had been aggressively campaigning across the state, hoping that the first Southern primary would revive his candidacy. Actually, it turns out we knew ye all too well. I will now use this occasion to take a victory jog for my early and prescient blog post, “Why Rick Perry Won’t Win,” because, honestly, I don’t get the chance all that often. The truth, though, is that Perry turned out to be even more of a moron than I ever suspected. At the very least, I figured he was a canny politician, even if he needed to make the transition from Texas canny to national canny, and he turned out not to be. I’m not sure we’ve ever quite seen the combination of debate flubs (“oops” etc.) 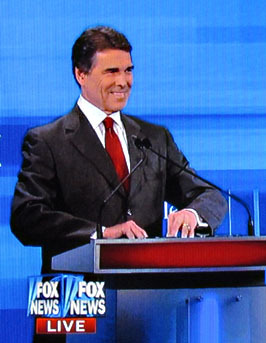 and debate gaffes (Gardasil, immigration) from another candidate that we saw from Perry. Back to Texas, Rick, though I’m not sure even they want you back at this point.